The Sunflower Wrangler, as Ernie Margheim was known, was born in a small town in western Kansas, Wakeeney. It's a best west of Hays, Kansas along today's Interstate 70. Ernie isn't afraid to say that maybe he was more of a want to be singer and performer than perhaps those that were fortunate enough to 'make it'. Ernie considers his music career to be an exciting period and experience in his life. Ernie took voice lessons,(which included breathing exercises), guitar lessons, piano lessons, played bass viol in concert band, and also played violin in the concert orchestra. As many young aspiring singers would do back then, Ernie entered all the amateur shows and contests where performers were judged by the audience responses. He notes, he wanted to be PREPARED when his opportunity came. He auditioned at various radio stations. He also appeared with various medicine shows that were common in that era. We asked Ernie about his experiences with the medicine shows of those days. Ernie did not travel with those shows. Whenever they came to town, they welcomed local talent and gave them an audience. He tells us he never tried the "cure all tonic" that was peddled for a dollar a bottle. He was still a student at Hoisington High School in Kansas at the time. Some of the shows would make him an offer to gravel with them, but his family thought he should finish his education. Ernie tells us that they hawked that product like an auctioneer would do - and promised to cure everything under the sun. The perfomrers would work their way through the audience, holding the tonic bottles as they went and touting all the ailments and illnesses it was supposed to cure. Folks in the audience would indeed buy it. But Ernie steadfastly tells us - he never tried the stuff. The "tonic" was bottled in Wichita, Kansas, by the promoter, and probably was a concoction that was partly alcohol. Ernie says he never knew what was in it. He thinks it was probably illegal by today's standards. Or maybe all medicine shows had their own label put on a professionally manufactured and bottled health and Vitamin TONIC, as they called them in those days. 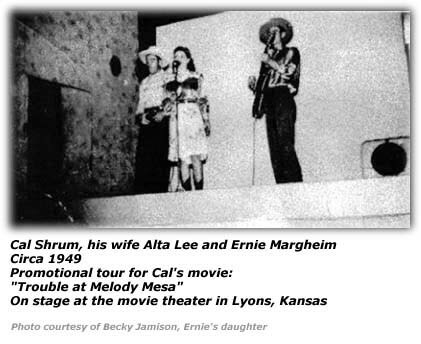 They came around to all the small western Kansas towns and regularly pitched their tent on an empty lot, and promoted their show up and down main street with loud speakers on a car top, telling local residents of performances they would see. Traveling with the acts and shows that came through town was not something he could do as much as he wanted to. Although he did not travel with the shows that came through the area, they knew who he was and was asked to work with them every summer they came through the area. He notes he used his National Duolin (Steel body) Guitar - perhaps feeling a bit lesser than the stars who were using and Martin and Gibson guitars, but Ernie said he still felt pretty good. Ernie recalls he sang and yodeled (in the Wilf Carter/Montana Slim style - who was Ernie's idol and hero). He also included tunes from the Blue Yodeler, Jimmie Rodgers repertoire. The songs he heard over the Border Radio also had an influence on him as they were going strong in those years. He would take in stations such XEPN and XERF. Some of the acts he recalls include Cowboy Slim Rinehart, Dallas Turner (he recalls high-powered commercials during his shows), the Carter Family, Nevada Slim, the Monroe Brothers, Jesse Rodgers as well as numerous religious programs. Ernie told us of his memories of Roy Faulkner (the Lonesome Cowboy), who worked with one of Border Radio's legends, Dr. J. R. Brinkley for several years. Roy knew many songs from memory, including "...umpteen verses" of the tune Abdul-The Bul-Bul-Lameer. Roy later moved to Topeka, Kansas where he joined the other folks on WIBW and their Round-Up gang. In 1940, after he had graduated from high school, he enrolled for a stint with the Civilian Conservation Corps. He then hooked up with radio station KGVB in Great Bend, Kansas and Harry Wright, another Border Radio star known as the "Lone Star Yodeler". Ernie relates, Harry came to Great Bend with a traveling medicine show one year and decided to stay and got Ernie to join him on the air as part of his show. Ernie includes many details in his recollections - such as the fact that Harry played a mahogany Martin guitar and his theme song (every act had one in those days) was The Old Oaken Bucket. At the same time, he began his career as an accountant with the Thies Packing Co. - a career that would last some 54 years. But in 1942, he was drafted into the U.S. Army. But try as he would in the late 1930s and early 1940s, circumstances just did not provide him with the opportunities he was trying to find. World War 2 had arrived on the American scene, the military draft was put in place, medicine shows were dwindling. His personal life also saw him getting married on July 9, 1943. Four years later, they were raising twins that were born in November of 1947. But alas, Ernie and his wife divorced 1949, with Ernie having custody of the babies. Live radio at that time was being taken over by networks, such as Mutual Broadcasting. Publishing organizations ASCAP and BMI were in turmoil. During that time, Ernie relates that stage shows at movie houses and dances were how the local acts gained exposure. He found himself appearing at all the VFW, American Legion, Eagles, Elks Halls; the Honky Tonks, townsend clubs, organizational picnics which enabled him to earn appearance fees. At times Ernie and his band had three gigs in a week. Sleep was at the bottom of their lifestyle - they caught up when they could. Ernie married his second wife on March 18, 1951 - they were married for 46 years; she passed away in February 1997. For a time, Ernie worked with radio station KVGB in Great Bend, Kansas, a town southeast of Hays, Kansas. He would be on the Farm Hour show at 6:30am in the morning that included Commodity and Livestock market reports direct from Kansas City. The old cars they used back then did not help either as they had to deal constantly with leaky radiators, low on gas, low on money which would then mean postponing a few meals. It all came with the territory Ernie says. But with all these entertainment engagements, Ernie and his group all still had an 8 to 5 job and a family to go back to at home. They were fortunate that their employers back then were flexible enough to allow them some slack for their personal appearance commitments. 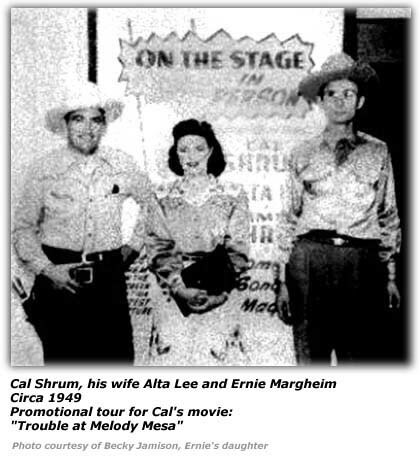 Ernie notes in his Blog that for a brief time he was a part of Cal and Alta Lee Shrum's show and did personal appearances at such venues as movie houses as an "in person" appearance to coincide with the showing of their B- Western movies. Ernie told us of some the groups of entertainers he worked with. One group was the Smoky Valley Boys. The band did weekly dances Ellinwood, Kansas on Wednesday night at the Mannicure Hall. On Friday nights, they appeared at the Woodman Hall in Great Bend, Kansas. The band would do occasional programs over KVGB, but apparently not the full band would appear, perhaps only a fiddle group, a total of five musicians. Band members included Alex Ehrlich on fiddle and saxophone. He was also the leader of the band. Johnnie Ochs was on the saxophone. Ben Ehrlich did vocals, harmony fiddle and the saxophone. The band had a piano player; Ernie can't quite recall his full name, thinks his first name was Barnie and appeared with them only at Mannicure Hall in Ellinwood. Ernie Margheim (Sunflower Wrangler) was on lead guitar and doing vocals. George LaOrange was the band's drummer. Occasionally, Melvin Vink joined them on guitar. He recalled some other vivid memories associated with that band as well. WHen the Smoky Valley Boys played at the Mannacure Hall in Ellinwood, Kansas, the band often had a local high shool student play the whole dance with them, playing his trumpet. He used no charts or music when he played with them. Ernie doesn't remember his name but does recall that the student did get paid as one of the band members. At other times this high school trumpet player would bring a band member friend of his with him and also play with the Smoky Valley Boys, just for the experience of playing with a band, even if it was without getting paid. And again, the other students wouldn't use any charts or sheet music when they accompanied the band. The dance crowds liked the Smoky Valley Boys for that gesture, letting the local kids participate. They would sit in on full three hours the band performed. The Smoky Valley Boys would play popular songs the students had practiced at home and could join us for the dance number. The group might have to play in B-flat or E-flat to help them once in a while. But, Ernie says again, it went over big with the crowd. Ernie notes, Ellinwood is a small town, where "everybody knows everybody". But for their dances, they drew from three surrounding counties — Barton, Stafford and Rice counties. The dance hall also had other bands play other nights of the week as well. The dance hall was a local attraction. People did not have television in those days, so a dance with a good band, drew people out of their quiet evenings at home to enjoy the entertainment the bands offered. Those were good rural folks, Ernie says he did not notice much drinking among the crowd back then. Some came just for the entertainment, not caring to get up on the dance floor. Ernie paints a picture of what he looked like when he was on-stage back then. When he was the Sunflower Wrangler, he wore a gold color satin western shirt with trim, accompanied by a wine colored cowboy neckerchief, cowboy boots, and of course, a large ten gallon silver-gray cowboy hat, as shown in the Cal Shrum pictures you accompanying this article. He was six feet tall and about 155 pounds back then. The "Morning Farm Hour was heard daily over KVGB at 6:30 AM. During the show, the music would be interrupted once in a while with market information from the Kansas State Network, which they were wired into from possibly Kansas City. 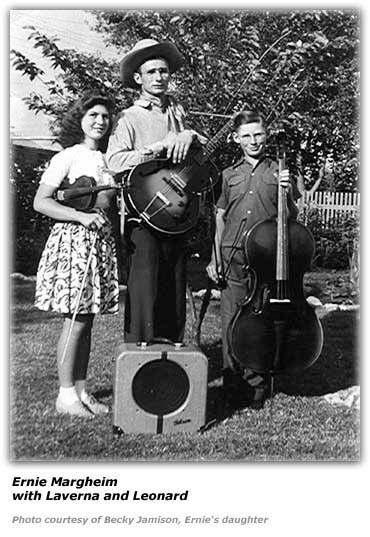 The performers on the "Morning Farm Hour" inlcuded Harry Wright, the announcer for the show as well as guitar. Ernie was on lead guitar and did vocals.Norton Ross played the clarinet and occasionally they would also have an accordion player join them, but Ernie doesn't recall his name. The band did personal appearances in the area, usually within an 80 to 100 mile radius. Ray Beals, program director for KVGB had a daily show that was on from 4:00 to 4:30pm. Ray would play the piano on the show and was accomnpanied by comedian Sammy Duck (when Sammy wasn't entertaining folks, he was a member of local police department) who did animated voices with Ray as well as jokes and other comedic routines. Ernie notes that Ray was an accomplished pianist and played mostly piano solos and occasionally a good guitarist accompanied him, whose name he can't recall. They played mostly popular music of the day. Looking back on those days, Ernie today feels he was in the WANNA BE, category. He notes, that the Lord did not have him cut out for the entertainment business, but rather his career was to be a career accountant at a meat packing plant and be with his family. He retired from the John Morrell Company in 1996 after 54 years - all at the same plant location. Ray Beals also had a ten to 14 member swing band orchestra. They would appear for special occasions at Municipal Auditorium dances. Ernie was a guitarist with the orchestra and did some lead numbers. The orchestra was made up of local musicians including school band members and music directors. Ernie states, Ray Beals was a local FIXTURE. Ernie also had his own 15-minute radio program that aired over KVGB on Saturday afternoons. This show was on the air when Ernie was just in high school. It was a solo show where he accompanied himself on guitar and did vocal and yodeling numbers that were popular in that era. We asked Ernie what folks got to hear when they saw the Sunflower Wrangler in person. If you recall, Wilf Carter was his idol and one of the favorite tunes Ernie did was one by Wilf called Swiss Moonlight Lullaby along with an echo yodel. When folks heard Ernie on the radio, he used to do a lot of Jimmie Rodgers tunes. He notes, the radio songs they played back then were mostly cowboy songs. 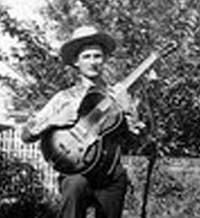 Tunes such as Little Joe the Wranger or Strawberry Roan were the type he would do. The audiences would certainly applaud those tunes he notes, but the dance crowds were a different audience. They wanted to hear and dance to the jukebox songs of the times. So, he and the band would do tunes that were made popular by folks such as Webb Pierce, Carl Smith, Al Dexter and many others that were popular in the Nashville / Grand Ole Opry genre. Ernie could "play by ear" and in that line of though, he remembers before a dance the band might stop in a cafe for coffee or a beer and hear a a new song on the juke box that sounded like something their audience would want to hear. Ernie would write off the words in Gregg Shorthand. The melodies were so basic and thus, easy to learn, they would sing and play that new tune for the dance that night and unrehearsed! Bob Wills was big at the time, so western swing numbers made popular by Bob and the Texas Playboys were a part of their show as well. Ernie was emphatic about Bob Wills - EVERYBODY REALLY LIKED THEM AT THAT TIME. Dancers would often come to the stage and request a Bob Wills Song, some even gave them a $5 bill to do it as a dedication for somebody's birthday, or some other occasion. At some dances (for local church reasons), they tried to wrap up things at midnight on Saturday night. But some dancers were under the influence of what they had been imbibing during the evening, gathered up a few $20 bills and asked us to play another hour. Management of the hall said it was OK with him so the band played until 1:00AM at times. Once in a while they wanted them to go beyond 1:00am, but that's where they drew the line; no deal Ernie says. The members of the band had to go home, get some sleep, and attend church and Sunday School in the morning. Ernie also taught a Sunday school Class at 9:00am. His wife taught 4-year olds for 34 years; Ernie taught junior high or senior high youngsters for 30 years. There were times when the musicians had to drive 150 miles to play a dance. Instead of driving his car, Ernie would ride in the back of someone's pick-up truck with a topper but it had just a plain steel bed. Just Ernie and his guitar and speakers. Sometimes, two of them rode that way. They would take a blanket and sleep on the way home, catching a few extra winks. They would get home around 3:00 or 4:00am. He fondly laughs at those memories. Fortunately, he says, through-out his career, he never ran into any booze problems, Nobody drank in the bands he worked with and he did not either. I was a well behaved Christian boy. His memories start coming back a bit more as he recalls other times. One year they had a Friday night dance he said, "Boy howdy, let me tell you, when it was Good Friday, I Prayed for God to forgive me and not let it be Judgement Day while I was away from home." During Lent, the group had a Wednesday night dance somewhere but first he had to sing in the 7:30pm Lent Service with the choir. He wore his choir gown over his cowboy attire, without the neckerchief and cowboy hat, and sang during the service. After the service, he took off the gown and headed over to the dance, about ten miles away where the entertainment started at 9:00pm. For their closing dance number, they usually ended with Home Sweet Home or with some bands, Goodnight Irene. I don't know what song it is a part of but I also remember the phrase "Goodnight Ladies, Goodnight Ladies. We are going to leave you now". Ernie is mostly retired with MEMORIES (and he emphasizes that himself). He visits with long ago friends when they come to town. But he notes he has not had his D-18 Martin or my ES-150 Gibson, and F-5 Ibanez Mandolin, and his trusty fiddle, out of their cases for a couple of years now. He had a Gibson guitar speaker as well; it was the 150 model that had three input jacks, two instruments and mike. It was and is LOUD, He still has it. He notes he has not touched his Hohner Marine Band Harmonicas in years as well. He gives us more insight of what it was like back in that era as he tells us that like all rural farm boys, he carried a harmonica in his pocket along with his red handkerchief as far back as he can remember. Before he could afford the Marine Band harmonica though, he had what they called "STAND BY" (which cost all of 35 cents) was known as the cheaper Hohner. In those bygone years, he used to think MUSIC was his middle name. During his high school band and orchestra days, he had the band director help me with HARMONY books he checked out of their library. He simply did not want to be just a three-chord country picker. So the folks did laundry and ironing for their music teachers to pay for the lessons the kids took — piano, voice, guitar. His sister became a piano teacher; his son is a church organist at a large Methodist church in El Paso and teaches public school music to elementary grade kids. But Ernie notes, ole Grandpa brings up the rear with a few cowboy songs. The Sunflower Wrangler still enjoys his memories of those years he spent in the hillbilly music business and still provides readers with tidbits of those memories in his online Blog. He currently resides in Colorado where his daughter Becky is able to help him deal with the foibles one encounters in old age. Ernie did celebrate an unusual occurrence this past summer - celebrating his 88th birthday on the 8th day of the 8th month, August. Hillbilly-Music.com wishes to thank both Janet McBride for letting us know about Ernie aka the Sunflower Wrangler and to Ernie himself for providing us with more details as we passed along our inquiries.